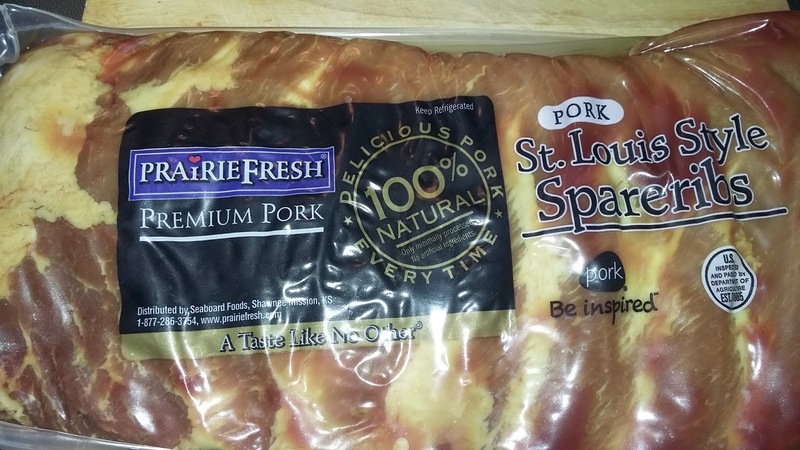 I don't normally buy spare ribs. I like them, however they tend to be a bit pricey and, since there seems to never be enough for all of us if I get just one rack, I usually have to buy two. And, when I came across this particular product yesterday morning, I did have to give my purchase some consideration because, even though they were on sale, it was still about $10 per rack. I did, ultimately, end up making this purchase yesterday morning. And, after having them for dinner last night, I have to admit I was very impressed with them. I decided to make these in the slow cooker because it was too windy to grill them and I figured they would take too long in the oven (I'm usually pretty hungry by the time I get home from work). This worked out well. However, I did discover I was only able to make one of the two racks I purchased because there simply was not enough room in our crock pot. Fortunately, as it turns out, this was actually not a problem. Unlike many other spare ribs we've had in the past, these actually had quite a bit of meat on them. Rather than only having a couple bites per rib, these had enough meat to make them much more filling. As a result of this, not only was one rack enough for us (for the first time since my teenager started sharing them with us), we ended up having leftovers. I also thought the overall quality of the meat met my expectations. There was probably a little more fat in these than I was expecting. But, the meat was very tender and easy to remove from the bone as a result of that. It also had a good flavor that was enjoyable whether we used barbecue sauce on them or not. As a result of all of this, I definitely feel as though I got my money's worth. Since I didn't use the second package of these, I have another rack in my freezer for another date and, after trying this brand, I do feel I will purchase spare ribs more often in the future.